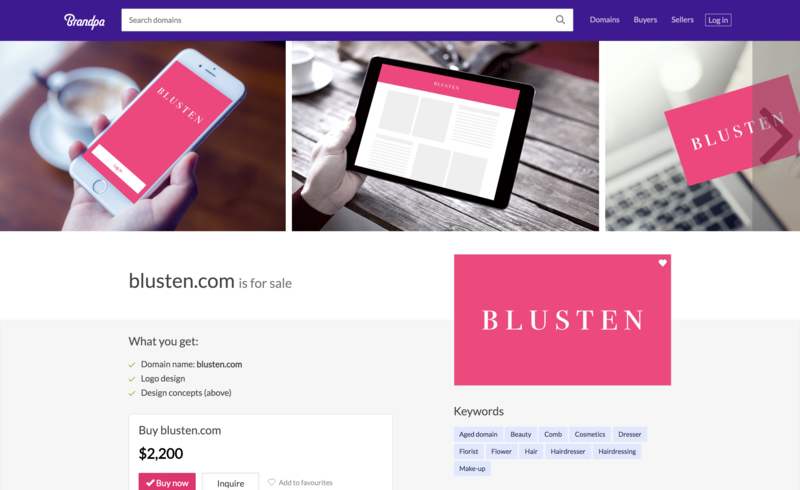 Our marketplace makes your domains look better, which means more sales for you. In addition to a custom-designed logo, we showcase how your names could look in real life. See examples: Converco, Blusten, Drivello. A one time charge of $5 covers your domain listing and logo design. We charge just 25% of the domain's price, when you sell, or less. No sneaky logo or transaction fees - you simply get 75% of the selling price. What names can I sell? We're looking for domain names that make good names for businesses or products. We only accept dot-coms with 12 or fewer letters before the dot. See our detailed guide on what domains we do and don't accept. No. We need to make sure that if someone buys your domain name, they will receive it. To ensure this, you must redirect your domain to the appropriate name page on brandpa.com. We only accept .com domains. In the past we accepted some other TLDs, but experience has taught us that nearly all our customers want dot-com domains. How can I submit my domain names for listing? Simply register to the Brandpa marketplace and submit the domain names you’d like us look into. We'll contact you once we review them for you. What does the $5 listing fee cover? Your listing fee goes towards designing your logo, and writing your listing. Please note, when your domain name is listed with your new logo, the logo is still owned by Brandpa. If for any reason you decide to stop listing your domains with Brandpa, we reserve the right to reuse the logo for a different domain name. You are able to set your own price, but it must be at least $1,000 USD. Once the domain name you submit to us gets approved, we price it for you, however, you can suggest a new price once a listing is approved, but not after your domain has been listed or sold. Do all names get mobile / letterhead / website designs? We reserve these elements for higher-value domains, at our discretion. You can choose to be paid via PayPal or wire transfer. How does Brandpa's commission rate work? Read about our commission structure. Can I provide a logo I've created? We can take a look at any logo you’ve created but we can’t guarantee we’ll use it with your listing. Providing a logo does not impact your listing fee. We allow customers to make an inquiry about a domain, which we forward to you. You can ask us to negotiate on your behalf, and choose to accept a lower price if your wish. You can configure how negotiation works for each of your domains. Sometimes Brandpa may offer coupons as part of a marketing campaign to increase sales. For example, we might partner with a website who could deliver many visitors to us, in exchange for an exclusive discount for their members. Sellers may choose whether they want their names to accept coupons during these campaigns. If you do so, you allow Brandpa to offer your domain at up to a 10% discount of the domain's list price during such a promotion. When a domain is sold at a discount, the amount paid to both the seller and Brandpa is reduced by the discount percentage, e.g. if a domain was discounted 10% then both Brandpa and the seller would be paid 10% less. What if I want to stop using Brandpa? You are free to remove your domains from Brandpa at any time, however you must notify us of this. You should also know that once you remove your domains, any logos or visuals that we created will be lost. You must also agree to complete any sales which have already been paid for. Do I need to point my domain name to Brandpa’s servers? We verify the domains you want to list on our marketplace are the domains you own. If anyone visits your domain, they will be shown that domain on Brandpa’s marketplace. Your domain name is more likely to be sold that way. How do I point my domain name to Brandpa’s servers? Please read our guide on how to point your domain names to Brandpa. What happens after I point my domain name to Brandpa’s servers? We check whether the domain names were pointed to us properly. If so, we prepare a logo, descriptions and list your domain names to our marketplace. You'll be notified about this via a separate email. See our Terms and Conditions for sellers. How do I ask you a question? You can submit a request for our support team.